Greetings friends and fellow crafters, LeeAnn here with a project made using Product from Super Sponsor White Rose Crafts. 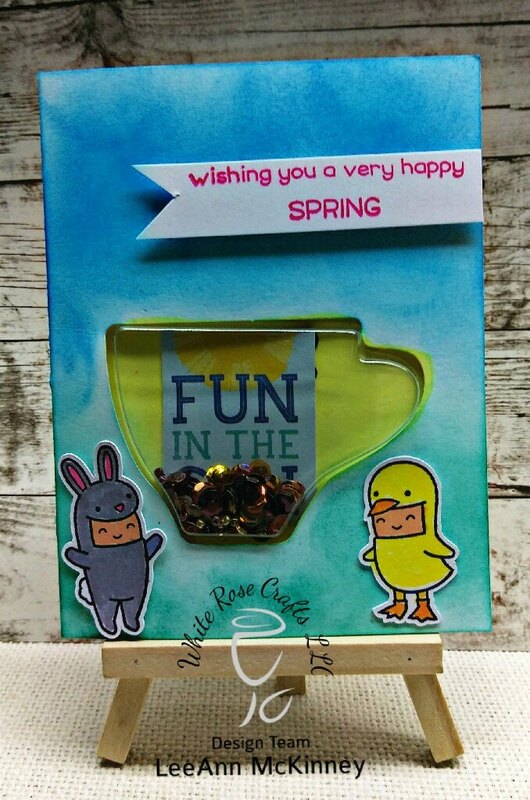 For today's project I used the Jillibean Coffee Cup Shaker set, Sparkle Blends "But First, Coffee" sequin mix, Lawn Fawn's "Easter Party" stamp set, Scrapberry Inks in Blue, Pink and Green. Distress Oxide in Squeezed Lemonade. Memento Tuxedo Black for stamping the images. I love the shaker element in your darling coffee cup! how fun to have added a shaker to your card. cute idea. How cute and fun with shaker! Oh so cute, love your shaker card! I love your shaker card. Great design and colors used too. love this cute shaker card.